Head coach Zdeněk Ščasný did not hide the fact that he had imagined his premiere on the Boleslav bench with better results. “We wanted to win at home, but we failed as we didn’t start the first or the second half well and didn’t play the way we wanted. I saw a lot of effort but also nervousness from the players,” said Ščasný after a tie with Most. 14. 09. 2007 | The matches of the tournament will be played on six pitches, in Mladá Boleslav, Liberec, Jablonec nad Nisou, Plzeň, Příbram and in Prague on the Viktoria Žižkov pitch. The general secretary of the ČMFS (Czech-Moravian Football Association) Rudolf Baťa has been appointed chairman of the organizational staff of U19 EURO 2008. This information was published on the official website of the Czech-Moravian Football Association on the basis of the decision of the executive board of ČMFS of Wednesday, September 11, 2007. Only one point separated both opponents before a match of the fifth league round. Nothing changed after the match even if Mladá Boleslav was only several seconds from a three-point gain. In spite of the fact that also players of České Budějovice had excellent scoring chances for winning the match, loss of win in the final seconds of the additional four minutes was cruel for Mladá Boleslav. “When we lead in the ninety-third minute, we should keep it and this is pity to lose two points in such situation,“ sighed Tomáš Sedláček after the match. He expressed feelings of the complete team from an unlucky match. He will substitute on the bench Luděk Zajíc who coached the league team for almost four months. The board of the football club decided about the change on the first September’s Monday and the new coach guided a training exercise of the Boleslav team already on Tuesday, September 4, 2007. Thanks to a break for national matches, Ščasný has two weeks for preparation of the team before the sixth league round and only by several days more for preparation for the first duel in the UEFA Cup now. Zdeněk Ščasný who celebrated his fiftieth birthday at the beginning of this August has a rich playing and coaching career behind him. He was without contract currently and football public perceived him as a co-broadcaster of the Czech Television at live broadcasts of the matches of Gambrinus League. Mladá Boleslav meets the Sicilian club Citta di Palermo in the first round of the UEFA Cup. The first match will be played in Mladá Boleslav on September 20 while the retaliation match in Palermo on October 4. The Sicilian club was drawn for Mladá Boleslav by the UEFA representatives of five options represented by Ajax Amsterdam, Citta di Palermo, Blackburn Rovers, Sporting Braga, Stade Rennes in Monte Carlo in Friday’s early afternoon on August 31. Desire to meet the English club was prevailing among the players of Mladá Boleslav. The players believe that they have chance to qualify in one of autumn five-participant groups of the UEFA Cup in the matches against Palermo. 03. 09. 2007 | The promising twenty-three years old defender Václav Procházka will strengthen the defensive line of FK Mladá Boleslav. The former Plzeň’s player passed necessary medical examination on Monday and he will participate in a training exercise of Mladá Boleslav for the first time on Tuesday, August 28 in the morning. The club offered him a four-year contract. The had-coach of Mladá Boleslav Luděk Zajíc could enjoy win for the first time. His counterpart Jaroslav Šilhavý from Kladno came among journalists with mixed feelings as he said after the match of the fourth league round. In fact he believed that at least one point had been closer to reach of his team than he had expected initially. Boleslav’s Zajíc refused to assess in front of journalists whether the summer newcomers come up to expectations or not. The Central Bohemian derby was very important for Mladá Boleslav. 23. 08. 2007 | The coaches of Mladá Boleslav and Jablonec declared identically that much would be at stake before the last match of the third round of Gambrinus League: “It will be the match who is the stronger one.“ When they sat down beside one another in the press centre in Jablonec in the evening after the match, they did not change their opinion too much: “It was the match who was the stronger one.“ But without decision this time. This was accepted by Luděk Zajíc from Mladá Boleslav much more disappointedly than by his opponent, Jablonec’s Luboš Kozel. 15. 08. 2007 | Extraordinary importance of the Saturday’s match between Sigma Olomouc and Mladá Boleslav resulted from an alarming fact that both teams failed in league opening. Olomouc in České Budějovice and Boleslav in the match against Viktoria Žižkov. Both coaches, coincidentally beginners on first-league benches, were aware of this fact. Martin Půlpit, the head-coach of Olomouc, could skip for joy while Luděk Zajíc from Mladá Boleslav had to accept the second tight defeat 0:1 with a frown after the final whistle. An old Czech proverb says optimistically that a poor beginning advices a good end. But the players rather believe that they will reach good final position in the league if they start well. Mladá Boleslav started this league season poorly. Is it good or bad sign? 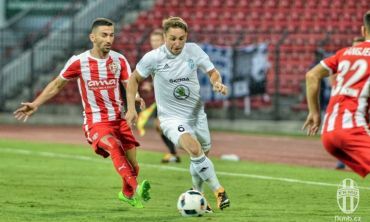 It has not happened to the team of Mladá Boleslav that they would not score any goal in the opening match of Gambrinus League. Only this year against Viktoria Žižkov.